As a part of my continuing quest to learn and advance further into internet marketing, I’ve started doing a little bit of work in pay per click (PPC) advertising. Last time I wrote about the key PPC metrics, what each of them mean and how knowing them is vital to understanding the successfulness of your campaign. Since then I’ve done a bit more work in PPC and progressed on to writing a few new adverts myself. I’ve found that it might look easy at first, but a lot of thought goes into each advert. Firstly, PPC ads must follow certain guidelines when being written. In Google AdWords the text on each of the lines of an advert has a character limit, for instance. Titles are limited to 25 characters, whereas the two description lines and display URL are limited to 35 characters. There are limitations on what you can actually write too. Your ad must make sense and have proper grammar, plus you’re only allowed one exclamation mark and it must not be in the title. Trademarks aren’t allowed in the ad text either and words like “best” can’t be used without proof on your website to back it up. And that’s not all. These are only a few of the criteria you must follow, and you must also remember you’re trying to advertise something too! An advert containing a clear, readable message with a reason for people to click on it works the best. This is a call to action, like a sales pitch. This message could read something like “Call today for a free quote” – people are more likely to do something if you tell them to do it. The word “free” would make it more attractive to them too. Keeping the ad text relevant to the keyword and what people might be searching for will help them relate to it and they’ll figure it’s suitable for them as well. And the best bit about PPC ads is that you can run two or more similar ads next to each other and see which one generates the most clicks. From there, you can keep making changes and improving. 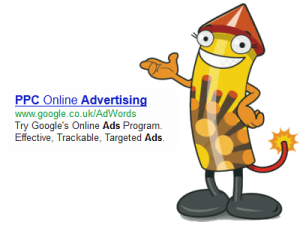 There are a lot of other bits behind PPC ads, such as keywords, negative keywords and ad groups; but this covers the basics in writing an advert. Katie has written more on the subject of writing ads in this post, so check that out for more information too.